Whether it's to replace a lock with a lost key or change an ailing lock for a new one, removing your cylinder door locks isn't a difficult project. These locks work by means of a key which is inserted into the cylinder. 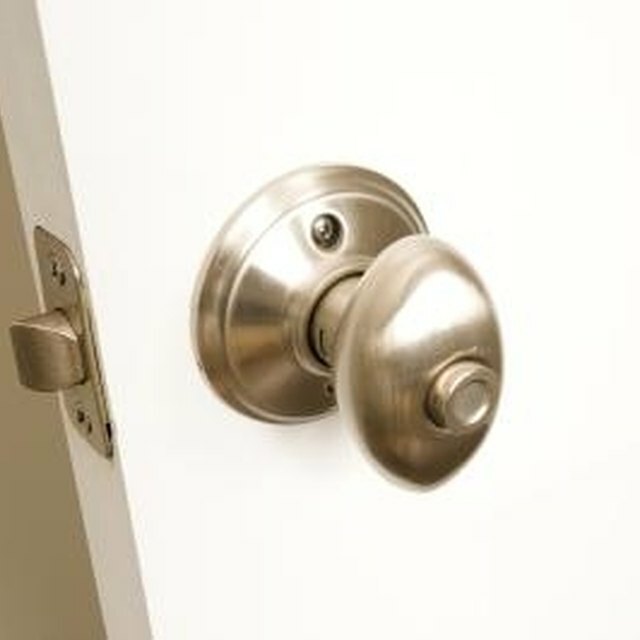 As the cylinder turns, it opens and closes a latch, which secures the door. A power drill with a Phillips bit will go a long way toward making this project easier, as cylinder door screws can sometimes be quite long. Remove your old cylinder door lock to replace it with a new one. Open the door if it isn't already. Position yourself on the inside of the door. Unscrew the two screws on the back of the cylinder barrel with the Phillips screwdriver or a power drill with a Phillips bit. Cylinder screws can be quite long, so make sure that they're unscrewed all the way before removing. Pull out the cylinder barrel and the flange, the metal part that surrounds the barrel, from the back of the door. The front side of the cylinder barrel can then be pulled out. Turn the door so that you are looking at the latch on the side straight on. Unscrew the two Phillips screws holding the latch in place. If you are concerned about scratching the door, you can surround the lock with tape while you are working.